Highlights of the Tour : Explore the most popular hill stations of the north west Himalayas including Shimla, Manali and Parwanoo. Overview Popularly known as Devbhumi- "Land of Gods," Himachal Pradesh is a beautiful hill state nestled in the Himalayas. The beautiful landscape stands apart from its neighbors not only in terms of sheer topographic diversity but also breathtaking pristine natural beauty. It provides a majestic view of high-altitude Trans-Himalayan desert, dense green deodar forests, apple orchards, snow capped mountains, beautiful lakes and meandering rivers. The special tour package takes you to the most delightful destinations in the western Himalyas including Kullu, Shimla and Manali. Inclusions Accommodation, Meal, Transport, Services of local guides for sightseeing tours. Exclusions Shopping and meals apart from breakfast, lunch and dinner included in itinerary. Day 01: Delhi On arrival transfer to hotel , then Breakfast followed by guided tour of Delhi - Places include Parliament House, India Gate, Qutub Minar, Red Fort, Humayun's Tomb and Jama Masjid. Evening - Leisure with individual activities, overnight stay at hotel. Day 02: Delhi - Parwanoo Early morning drive to Parwano (225 kms). On arrival transfer to Ropeway Resort. Enjoy the invigorating air of the mountain and breathtaking view of meandering rivers. Overnight stay at resort..
Day 04: Shimla After breakfast guided sightseeing tour of Shimla - Naldhera Golf Course, Fagu - Valley viewpoint, and Kufri - Snow point. Evening - Free to visit Mall Road. Overnight stay at hotel. Day 05: Shimla - Manali After breakfast checkout and drive to Manali - 280 kilometers. Arrival in the evening and transfer to the hotel. Evening free at leisure. Overnight stay at the hotel. Day 06: Manali Leave for local sightseeing tour of Manali after breakfast. The tour include visit to Hadimba Devi Temple, Vashisht Kund - Hot water spring, Tibetan Monasteries and Market. Spend the rest of the day at leisure. Overnight stay at hotel. Day 07: Manali - Manikaran - Kullu - Manali Morning excursion to Manikaran- Hot Water Spring followed by a visit to Kullu market, famous for beautiful handcrafted shawls and woolen clothings. Return to hotel in the evening and overnight stay. Day 08: Manali After breakfast, proceed for an excursion to snow points of the Manali- Rahla Falls & Solang Valley. Return to the hotel in the evening and overnight stay. 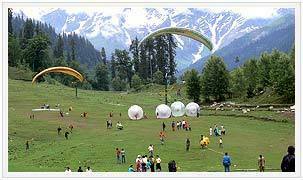 Day 09: Manali Day free for leisure activities and shopping at Manali. Day 10: Manali - Chandigarh Early morning drive to Parwano (320 kms). Vist rock garden , rose garden. Full day at leisure . Overnight stay at resort. Day 11: Chandigarh - Delhi - Back Home Check out after breakfast and drive to Delhi (238 Kms). Farewell dinner at Delhi and transfer to International airport for onward journey or back to home. Jetsave India Tours Pvt. Ltd has been into operations of visa facilitation since 1990 and ever since its inception our team has given utmost importance to client’s satisfaction. With over 27 years of rich experience of visa consolidation, Jetsave has built up good reputation with all the Consulates and High Commissions in India. We are considered as MOST RELIABLE and INDIA'S LEADING visa facilitation company. Most of our staff i.e. Senior Visa Executives and Front Office Executives is associated with us for over a decade and is well aware about the procedures and visa formalities for all countries. With our experience and expertise, we are able to identify urgent & complicated visa application and take appropriate actions to ensure that our valued clients obtain the desired visas in stipulated time frame. Please feel free to contact our team for all your visa related queries. Wish you all the very best.